Nobody should want to see Americans beating the daylights out of other Americans in our city streets, but it is starting to happen with alarming regularity. Americans have become more radicalized politically than ever before, and there is certainly nothing wrong with being passionate about what you believe, but way too often these very strong feelings are leading to outbursts of anger and violence. The “left” hates the “right” and the “right” hates the “left”, and the mainstream media and many of our leading politicians are having a good old time stirring the pot on a continual basis. It is almost as if they actually want violence to happen. For a very long time, many of us have been warning that civil unrest is coming to America, and now it is here. 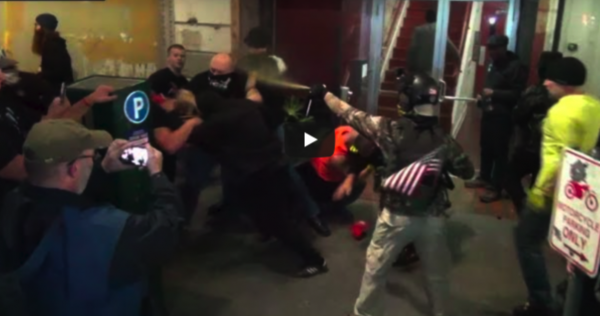 A demonstration billed as a march for “law and order” in the streets of Portland descended into chaos as rival political factions broke into bloody brawls downtown Saturday night. Members of the right-wing group Patriot Prayer and their black-clad adversaries, known as antifa, used bear spray, bare fists and batons to thrash each other outside Kelly’s Olympian, a popular bar on Southwest Washington Street. You can watch the brawl right here, and you can find some additional footage here. And it isn’t just on the west coast where this kind of thing is happening. Antifa just handed the Republican Party yet another messaging victory that will only help propel the simmering backlash to leftist “mob rule”. In a gesture that was intended to put New York City Republicans “on notice,” members of Antifa vandalized the Metropolitan Republican Club building, located on NYC’s Upper East Side, breaking windows and doors and defacing the facade with “anarchist” symbols, according to the New York Times. In a note left with the vandalism suggested that the damage to the left at the scene, the vandals declared that the attack was related to a planned appearance by Gavin McInnes, the founder of the Proud Boys, a conservative group that has publicly battled with leftist groups at rallies, protests and demonstrations across the US. As Democrats approach midterms – and more importantly the 2020 US election, former Attorney General Eric Holder had some advice during a Sunday campaign event in Georgia. Holder isn’t the only leading Democrat calling for aggressive action against conservatives. In a Tuesday interview, Hillary Clinton rejected the idea that Democrats should be “civil” with Republicans in the age of Donald Trump. “You cannot be civil with a political party that wants to destroy what you stand for, what you care about,” said Clinton. So it shouldn’t be a surprise when their followers commit acts of violence, because they are simply responding to the rhetoric of their leaders. And why isn’t the mainstream media reporting on these threats? But the elite don’t like the American people to be told the truth, and they are censoring us on a scale that would have once been unimaginable.